Size Height 285 mm, width 204 mm. Watermark Hills with latin cross on top encircled, crown above. Drake's identification: Watermark type 24. Drake's description: Greek cross in oval 40 X 45mm. Watermark found in 1630-32. Found in manuscripts 1631 (treatise on river flooding). 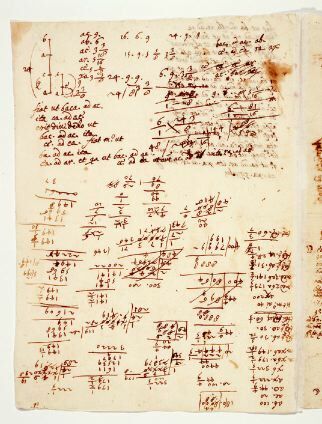 Comments Written by Galileo; contains calculations, tables, short texts, drawing. sqrt 32220 = 179 179/348?